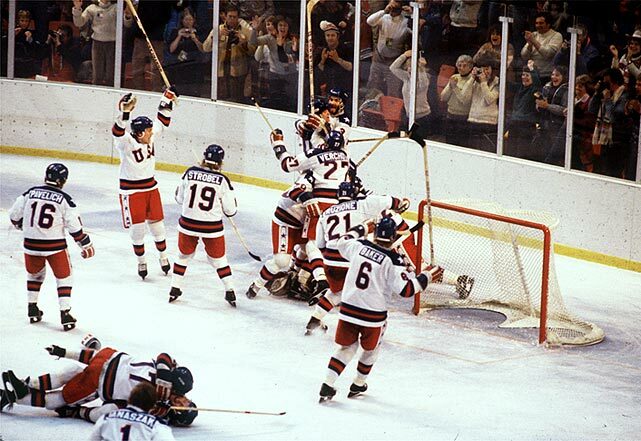 The Miracle On Ice — one of the enduring images of my childhood. I woke up this morning to find Ryan watching engaged in an Olympic hockey game on the DVR. The Slovenia-Sweden quarterfinal match started at 3 a.m. ET, but Ryan skipped his normal morning routine of checking scores first thing in favor of watching the recorded game. When I left for work he was watching a few minutes of Russia-Finland in another quarterfinal before leaving for school. He ran out the door to tell me that Ilya Kovalchuk, not a favorite in our house after he walked out on the New Jersey Devils, had just taken a stupid penalty. It’s been like this ever since the Olympic hockey tournament began last Wednesday. Ryan has interrupted all his normal NHL routines and fully embraced the Olympics — as he did in 2010. He even puts aside team allegiances in favor of country. Last week, Veronica relayed a story that happened while they were watching the morning news. Three members of the hated New York Rangers who are also on Team USA, Ryan McDonagh, Ryan Callahan and Derek Stepan, were on the Today show to promote the upcoming Olympics. Riley booed. Ryan was having none of it and started chanting “USA! USA!” at the top of his lungs. Upon hearing this story, I knew we needed a pre-Olympics viewing of Miracle, one of just two or three movies Ryan has watched to completion more than once. We watched the climactic scenes together. We discussed the geopolitics that went into making the Miracle On Ice so much more than a sporting event. We talked about the shots on goal, too, because that’s what we do. In case you were wondering, they were 39-16 in favor of the Soviets. Then came Saturday’s USA-Russia game from Sochi. Veronica, Ryan and I gathered around the TV at 7:30 a.m. ET for the early start. Riley joined us for the second period. For the next two hours, we sat, jumped, cheered, anguished, screamed and yelled, rapt, as one of the most extraordinary sporting events of my children’s lifetime unfolded. Team USA eventually prevailed in the eighth round of a shootout as newly minted American Hero T.J. Oshie scored four times in six shootout attempts. The scene in our living room upon Oshie’s final, game-clinching goal hitting the back of the net looked like the various YouTube clips of packed bars across America (minus the alcohol). Screaming, jumping up and down, hugging and a “USA! USA!” cheer. It was one of the rare moments that hockey crossed over the from the sports page to the mainstream news. We showed Ryan how NBC Nightly News opened with Team USA’s win. We showed him that President Obama name-checked Oshie in a tweet. He thought it was awesome. Today, Team USA begins the elimination rounds with a quarterfinal matchup against the Czech Republic. The game begins at noon ET. Plans have already been made for Ryan to preserve the surprise and watch on DVR after school. He is unbelievably excited. When I watch him watch Team USA in the Olympics, I see so much of myself. I was eight years old the year the Miracle happened at Lake Placid. I have vivid memories of that game and the gold medal match that followed against Finland. Times have changed. The Miracle On Ice was as much a product of the Cold War as the Olympics. Team USA were scrappy underdogs, amateurs and collegians. The Soviets were The Enemy — faceless robots that personified the tensions between the world’s two superpowers. The USA-Soviet game aired on tape delay, condensed into a two-hour drama for prime time. This morning, I watched part of Russia’s game, live, on my phone, while on the train to work. Team USA today is made up entirely of NHL players, as is two-thirds of the Russian roster. In 2014, one of Russia’s biggest stars, Alex Ovechkin, is the captain of the team that plays in Washington, D.C. The biggest “enemy” on Russia is Kovalchuk, because he walked out on a long-term contract with the Devils to return home. It’s not the same. It’ll never be the same. 1980 will never be repeated. And yet, as much as I know that to be true, and for all the differences above, I couldn’t help but feel a little of the same spirit sharing Saturday’s game with my kids. Ryan doesn’t need to have his experience diminished just because the world is so different now than it was 34 years ago. A few years later, the U. S. began using professional athletes at the games. Dream teams. I always found that term ironic because now that we have dream teams, we seldom ever get to dream. I love just about everything about Miracle. But I disagree with this line. No, 2014 is not 1980 and if Team USA wins gold, it won’t be the same. But to see my young children screaming “USA! USA!” and reveling in an Olympic contest played nine time zones away, is to wake up just a little bit of that 1980 spirit. I don’t need to be told it’s not the same. It’s just different, not less. I just hope my kids can make some of the same memories Veronica and I did so long ago. This is a great story! I just found your blog and love it’s premise and message. I use movies to teach my son, too, and while not a sports fan, I found myself getting excited all over again like in 1980 reading this post. Thank you!